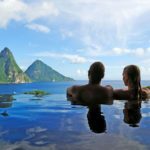 Summer Romance awaits at St Lucia’s #1 resort, Jade Mountain. Spend 7 nights for price of 5 this summer based on the ever popular, all-inclusive Total Romance package. 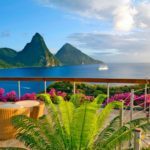 Jade Mountain is akin to an architectural masterpiece carved into the St Lucian hillside, not just another luxe Caribbean resort. Whether you arrive by land, sea or air it becomes clear that this wonder was crafted to provide a unique luxury vacation experience. 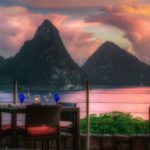 There are 29 unique suites aptly dubbed “sanctuaries” all boasting the most coveted view in St Lucia of the iconic twin peaks of the Pitons and guests are serviced by their own butler. 24 sanctuaries feature extravagant, heated infinity pools with hand crafted glass tiles. The remaining 5 boast lavish, oversized jacuzzis. Jade Mountain’s infinity pools gently cascade over the edge offering the illusion that they flow into the tranquil Caribbean Sea. The resort is set on 600 lush acres, has 2 soft sand beaches, a PADI 5 Star dive center, 12 miles of biking- hiking trails, an organic farm and chocolate laboratory. 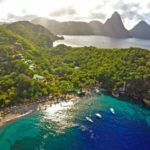 A variety of culinary experiences await including James Beard Award winner, Chef Allen Susser’s “Jade Cuisine.” The resort is located near St Lucia’s most acclaimed natural wonders and is also the only one on island with it’s own helipad. 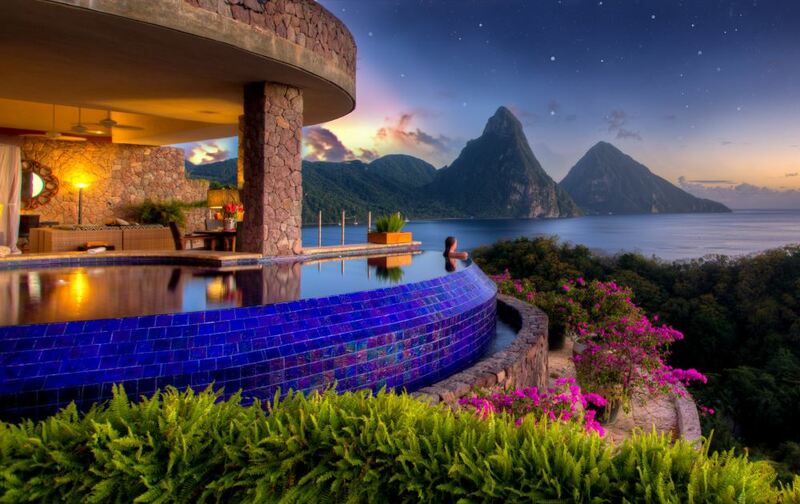 The Jade Mountain experience not just a view to die for but a feast for all the senses.